Something cats4jan said in a different thread got me to thinking. I have always done my photo printing from Elements; however, I have never been truly impressed with the results and my results have always been sporadic. Monitors all calibrated (in fact the friend with the calibrator thingie said that they were dead on with no room for improvement) and in agreement and paying meticulous attention to detail in the print dialogues, yet the printed product was always off in some way or other. Another thing I picked up on was that, it mattered not what changes I made in the print dialogue, Elements and the printer ignored them; and, several test prints, all with different settings, all were identical, as if nothing had been changed. Let Elements handle colors or let the printer handle colors = no difference. Choose "Natural" or "Vibrant" = no difference. Change paper types or profiles - without changing paper - = no difference. If there was anything remotely dark, those areas in the print would be really dark; if I brightened the image to alleviate the darkness, then the lighter areas would be blown out. Then I read cats4jan's suggestion to bypass Elements and "print from preview"; I assumed she meant the preview one gets when you open/view a jpeg in Explorer. I brought my jpeg up on the screen, clicked "Print", and, with no further input from me, just let Windows and the printer do their thing, just as if I were printing a text document. There were no options to check, no instructions to be given; just click "Print" and step out of the way. The results were magnificent; much better than what I had been getting by going the Elements route; now, I can lay a print alongside the monitor and they look the same; everything is in agreement. Printing from FastStone produced equally great results; however, no matter what I tried, FastStone insisted on leaving a 1/4" wide white margin/border; printing from Windows preview printed right up to the papers edge with no ugly white perimeter. Without telling my wife that I had done anything different, she said that that was the best printing I had done yet. Of course, I will still have to use Elements to create and print DVD discs and just have to put up with the black-out shadows and off colors. 1. How did your friend evaluate that the calibration of your monitor was accurate? Just because a "thingie" (your technical term) is mounted on your monitor doesn't mean that there is no light leakage or that the target screen settings for the calibration are actually met. 2. In this post you mentioned that you use generic inks that you purchase in bulk. That is ok as long as you then a create an accurate profile for your printer for the paper, ink, printer combination you use to make your prints. If you don't have an accurate printer profile then your print output observations (unsatisfactory prints) are exactly what one should expect. 3. If PSE and your printer are ignoring any changes you make in the print dialogue box then common sense would suggest that there is something not working correctly with your PSE and/or printer. Your observations are totally contrary to mine. Now you are starting to lose credibility with me because total agreement is impossible given that no printer has the capability to reproduce all the colours possible on a modern computer screen. 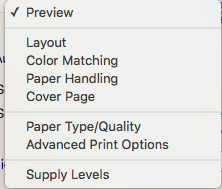 That is why the print dialogue box will ask you to set a "Rendering Intent" which tells the printer how to handle colours that it physically cannot reproduce exactly. With a properly calibrated screen and accurate printer profile for the paper/ink/printer combination, the best you can expect is a very close match between screen and print. Total agreement as you claim is impossible (unless your image contains just the colours a printer can actually reproduce). Printing from Preview and/or any other application without an accurate screen and printer profile and getting "total agreement" without setting any other parameters (as you claim), if actually true, is pure coincidence. I think of it this way. Given the properties (the way ink is absorbed and spread on paper etc) are vastly different and are dependent on the type of ink used for say plain paper (photocopy paper) and high gloss photo paper you must somehow tell the printer what type of paper and ink you are using. There is no way the printer can tell by itself whether you are using plain or photo paper or whether you are using generic or manufacturer inks. Thanks for your input on this printing issue! I am taking the liberty of quoting this post by cats4jan (Janice). This is the one you are talking about, isn't it? Janice and you are not alone. Problems with printing via Elements are not unusual (despite one having everything set up the right way -- paper type, profile, etc., etc.). 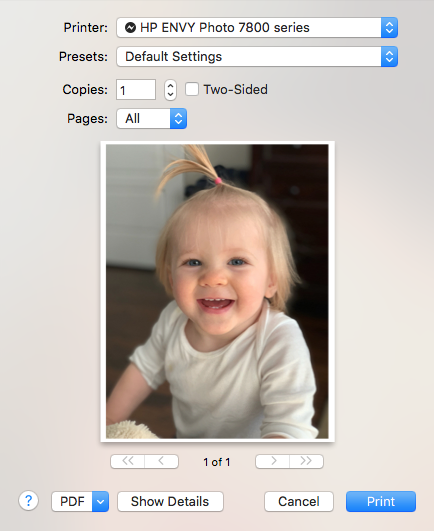 Reports of such problems are constantly being posted on the Adobe Photoshop Elements forums. So much so that Adobe has published Help documents with specific troubleshooting suggestions. Furthermore, they are known to have released updates/patches to handle printing issues with certain versions of Elements. So much so that Adobe has published Help documents with specific troubleshooting suggestions. Furthermore, they are known to have released updates/patches to handle printing issues with certain versions of Elements. The Update to 15.1 link refers to printing issues with MacOS 10.12 not Windows OS to my understanding. Also can you post a link to the Help documents you refer to? If the printing issues are as widespread and serious as you imply I am sure our members with printing issues will be interested in them. so you get a high quality product (which the price reflects LOL). My book pages matched what I see on my screen, so I know the monitor is calibrated correctly. Although my new printer is supposed to be a 'photo' printer, the problem with print quality comes down to the printer manufacturer. Since I'm doing a lot of printing that is unimportant, I bought an HP which I feel is inferior to Epson and Canon, but I bought it because of the price and the ability to take it back to Sam's Club within 90 days if I didn't like it. If I was back to printing my layouts, I'd invest in a decent photo printer. 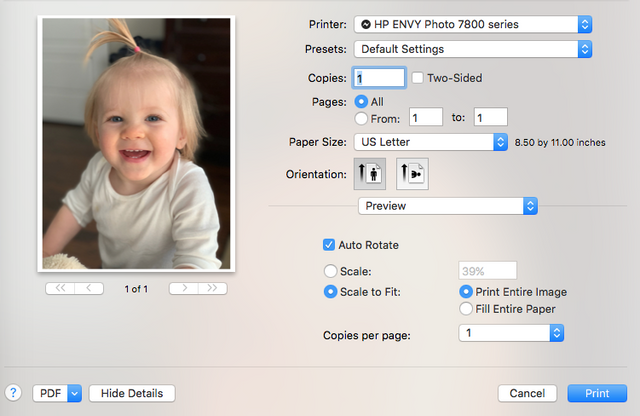 But really, in the end, when it comes to color rendering, it comes down to having your monitor calibrated because the newer printers do a pretty decent job with photos unless you are a purist. Finally, saved as a jpg and printed from Preview. Janice is on a Mac and Preview is Mac’s image software. Therefore, Janice is not printing with Elements. The examples that Janice posted show the interface of the Preview software. I thought this entire discussion was about NOT printing through Elements - finding alternate ways. That's why I didn't preface my reply with any comment about not going through Elements. Well, anyway, I never print through Elements because I find it cumbersome and I can't seem to make it do what I want it to do. I've experienced this when I had a PC, I experienced it with other brands of printers. I find it's easiest FOR ME to print from a jpg. And, you are right, the way my Mac handles that is through Preview. As I've had a Mac for 6 years now, I don't remember how my PC handled printing from jpgs, but I know I wasn't going through Elements to do my printing. I gave up on Element's printing ages ago. Thanks for pointing that out about the MAC, PeteB; I didn't catch it. Whether it be MAC or Windows, her statement is what led me to try other options to give simply printing from plain-Jane full-screen preview in Windows Explorer a try and I am glad that I did ! Whatever; I am very pleased to have found such an easy means of achieving such good results. A big THANK YOU to cats4jan for the statement that prompted me to try this, even if I missed the bit about the MAC. I am not going to get bogged down in a big technical discussion as to the whys and hows; it just works for me and that is all that matters. Yes that is what I thought this thread is about as well. But it's also about why a few people are moving away from Elements for their printing as I posted earlier. I can only speak about my experience with PSE and Windows. I have never owned a Mac. To be honest, I am not sure what all the hoo-ha is about PSE printing. I have never had any issues printing from PSE. It has always been fairly straight forward, especially after I got into colour management and how it works. Sure, PSE users will have issue with printing, just like PSE users have issues with other PSE features. That's part and parcel of any application I would think. Hopefully Sepiana will post a link to the help files she referred to, if they still exist (I suspect they no longer do), so our members who also have issues with printing might get some help to sort out their issues. Regarding using Preview, the Windows equivalent or any other application, they all work very similarly. They will all need to know what paper, ink and profiles you want to use. If you use any application's Presets then the Preset will make assumptions for you regarding some or all of the printing parameters. Hopefully Presets will produce acceptable prints on most occasions. The advantage, for me at least, with PSE is that I have total control to specify all printing parameters and that is the way I prefer to do my printing. Nowadays, I steer totally clear of printing Presets. 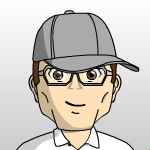 A big THANK YOU to cats4jan for the statement that prompted me to try this, . 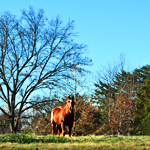 . .
BuckSkin, and I am glad you followed on her steps and have a successful story to tell. Kudos to cats4jan are in order! You are absolutely right. If it works for you, go for it! I am very pleased to have found such an easy means of achieving such good results. If it ever becomes mainstream among professional photographers I guess there will be a lot of worried screen/printer calibration tool and ink manufacturers.